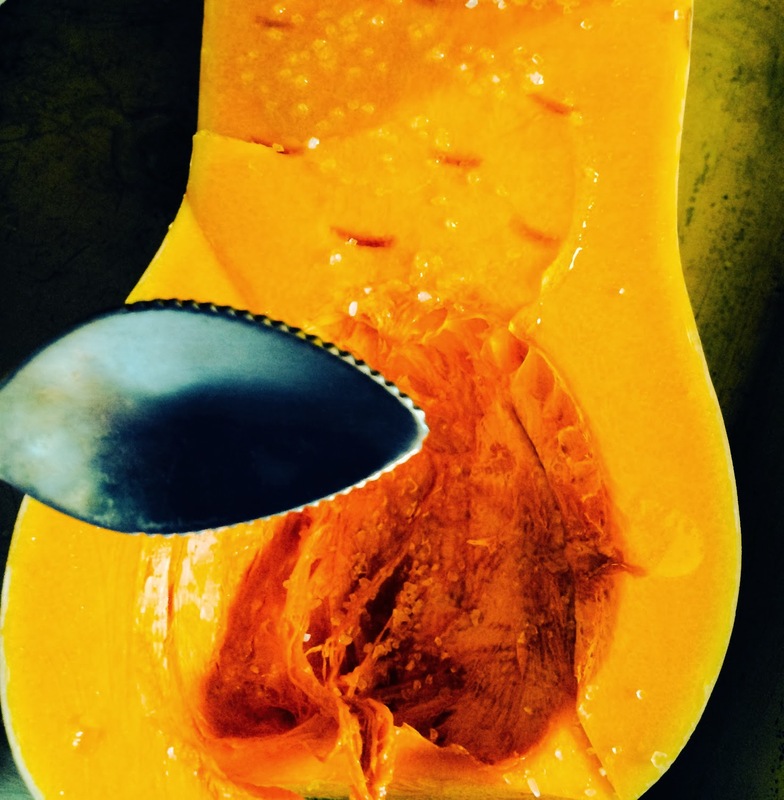 peacefoodlove: Shun-yata: The Knife Edge (& Growth Edge) of Emptiness--& Butternut Squash. Shun-yata: The Knife Edge (& Growth Edge) of Emptiness--& Butternut Squash. With great respect, I'm going to say that if you want to fully understand the Buddhist concept of Shunyata, or emptiness, you can just keep sitting there*. Because, even though words like void and thusness go down fine for me, I don't completely get it either. I get it just enough to be dangerous, which is exactly how it is with all cooking--and with all practices. Because the truth is, all you need in the contemplative kitchen is a working knowledge of any cooking concept--and the sincerity to Be with it. Add a pure love for "it" and the ever-expanding sense of spaciousness that comes from working with what you know in your heart will ultimately feed yourself and others, and you can almost stop obsessively Googling Buddhist-culinary-neuroscientific-Sanskrit terms that might overlap and come in handy someday in your practice. Because we all have to come to terms with the terms: knowledge is not the same as wisdom, and recipes are just worn & spattered cue cards. Wisdom, I am learning, is that which comes from all of your ahas and insights--from the paying attention and the Being Here that the cards could only cue you for. And it seems to come most from the times you almost cut off your finger along with the parsnips, precisely because you weren't paying attention. Wisdom is the cut-to-the-chase (and possibly the ER) scene: a realization like, say, that more than just skin-deep-down, you actually reaaaaally believed it was going to be possible to micro minutiae multi-task the moments of your life using pure intellect (no matter what your hero Daniel Goleman has warned you for 20 years, most recently in his masterwork Focus). You can't cut through a butternut squash with a butter knife, no matter what the terms "seem" to have in common. Wisdom is understanding that you are everything on either side of the cut--including the blade. You'll need a utility knife to help you get there, I know. We all need help cutting to the "AND." To cut this in smaller bites for myself, I think on Shun-yata as the knife-edge of emptiness implied by the knife itself. One-pointedness, then, is this incredibly precise tool that can help wake us up so we can skillfully (not to mention, safely) understand whatever form we're slicing through: what it is AND what it's not. But above all, it's a tool whereby we see just what's actually there on the cutting board, no more, no less. If "one-pointedness" doesn't work for you, throw whatever you have into the stock-pot definition: mindfulness, focus, attention, awareness. Being focused on the body and on psychological and emotional digestion--and having been numb & found being in my skin impossible for many years--I'm using the word "sensibility" a lot these days to describe my fledgling ability to bring full sensory attention to the actual beingness of being a human being. It's commonly understood among cooks that a dull blade is much more dangerous to you than a sharp one. 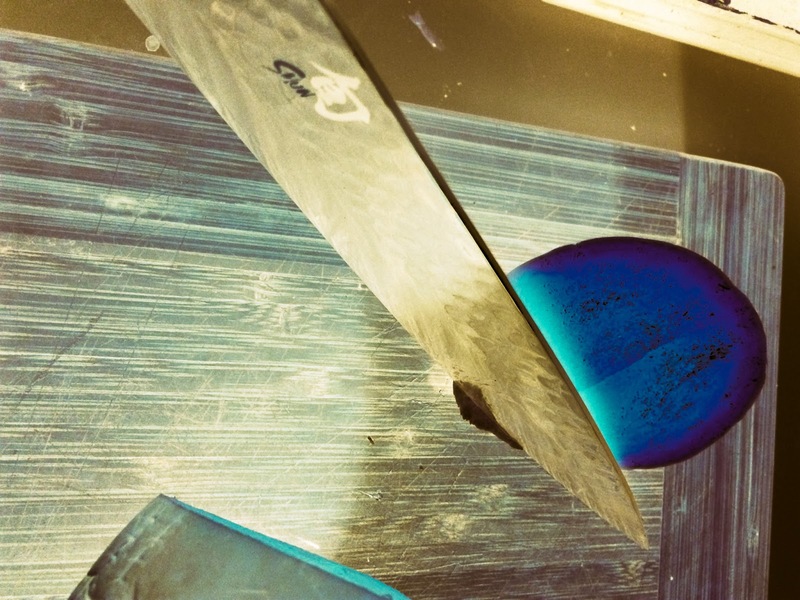 The reason is that a honed blade doesn't meet with resistance--and as we know, it's the reactivity of resistance to any form that will stick you, every time. That being said, if you were here in this tiny farmhouse kitchen, where cats who believe themselves to be jaguars, spirited children in search of the next experiment, and adoring, well-meaning but long-limbed husbands are often under foot, cutting board, & meditation cushion, while I'm working to cut through the thick rind of one type of this or that gourd (so I can get out of the real one, my thinky head), you might be bracing against the image of me with a brand new Shun knife, the slicing sound of which is famous in cooking circles for its fabled Samurai-stealth sibilance: sshhhhhun! 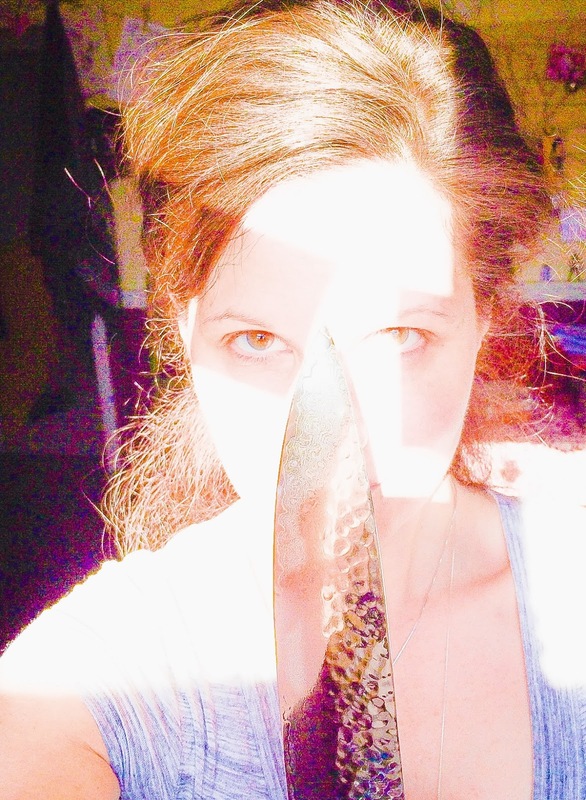 You might wonder how it is that Stacia, who regularly (yeah, fairly regularly) drops cast iron on herself, scalds tea kettles beyond recognition, and slips on literal & figurative banana peels as she navigates the art of becoming, could ever think about using such a famously dangerous blade. The answer is this: I'm not busy (over)thinking about using it when I'm using it. Or worrying that it's too big a tool for my britches. I'm just using it. Happily, that is the maven to my madness. were a great tool of my grandmother Viola's. You see, although I have less "figured out" than I had last year at this time, I have finally honed in on something. In his 1709 poem "An Essay on Criticism," Alexander Pope observed that "A little learning is a dangerous thing"--and so it is with honing. And with honing learning. The Growth Edge (I love this term, use it often) is this magical place that is well past cook-in-your-sleep comfort food territory, and just before the immobilizing no-clue terror of apocalypse without can openers and/or molecular gastronomy. The Growth Edge is plainly discomfortable--a healthy discomfort that is highly underserrated. I can tell you from teaching and learning to feed everyone from infants to Kindergarteners to college students to myself at 40, that this liminal space--between rigidity and abyss, form and formless, know and no-know--is the prime cut. Because it's the only edge on which we both learn to dance and dance at the same time. When the Growth Edge is sharp, everything on either side falls away cleanly--there's nothing there any more. 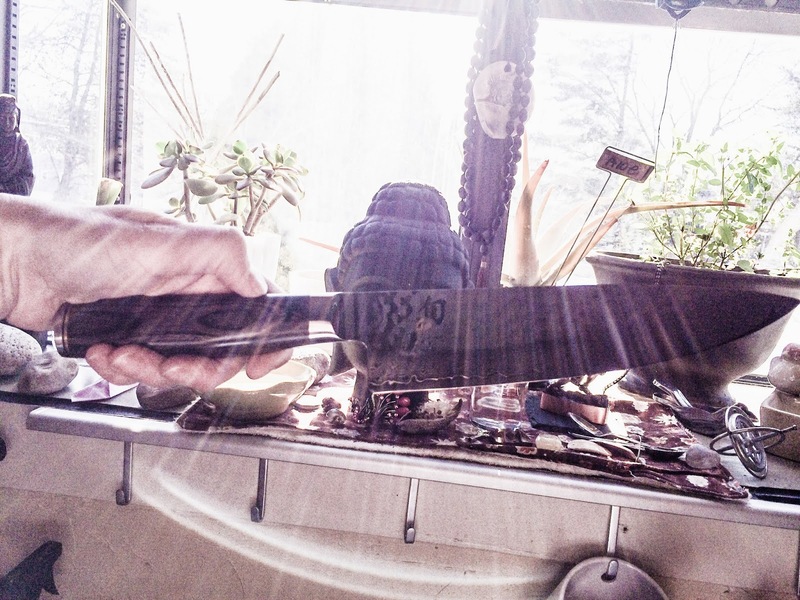 In fact, the only danger is that this Shunyata might cut so deeply you might not even feel it. Like cutting through the air, through the ether, through illusion--and like cutting through nothing at all. Hone Sweet Hone, gentle readers.